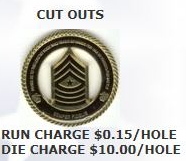 Thanks for your interest in our custom challenge coins. Please fill out the form below, and we will get back to you ASAP with your price quotation and artwork. If you have any questions, please don’t hesitate to give us a call at 1-302-376-9812. Need Help? Give us a call at 1-302-376-9812!